WASHINGTON — The Senate’s lone black Republican urged President Donald Trump on Wednesday to avoid inflammatory racial rhetoric such as his statement blaming “many sides” for the violence at a recent white nationalist protest in Virginia. 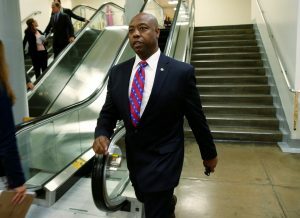 Sen. Tim Scott of South Carolina said he met for roughly a half hour with Trump and Vice President Mike Pence at the White House. He said the president tried to explain his comment, and why he said there were “very fine people” among the nationalists and neo-Nazis protesting the possible removal of a Confederate statue in Charlottesville, Virginia, last month. Scott bluntly criticized Trump for assigning blame in a way that put white supremacist protesters on equal footing with counterdemonstrators who turned out for the Aug. 12 protests, sparked by Charlottesville officials’ decision to remove a statue of Confederate Gen. Robert E. Lee.